Range: Beavers are found throughout Canada, north to the mouths of the Mackenzie and Coppermine rivers on the Arctic Ocean. In the rest of North America, the beaver’s range extends throughout southwestern Alaska and most of the states south of the 49th parallel. 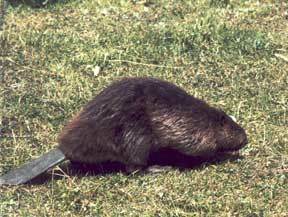 The beaver has been exterminated in some states, and in practically all of its former range in northern Mexico. Habitat: Most common in forested areas, beavers also expand into unforested habitats, where there are water-courses bordered by deciduous trees or shrubs. Each day, beavers alternate periods of activity and rest. They are most active from dusk to dawn. Midday generally finds them in the lodge, be it summer or winter. The beaver’s life is inextricably connected to logging—or sustenance and for habitation. This animal cuts down an average of 216 trees a year. It can fell trees up to about 40 cm in diameter. Usually a single beaver cuts a tree, but sometimes two work on a large one. Diet: All winter the beavers bring sticks from their underwater cache into the feeding chamber of the lodge to gnaw the succulent bark. They prefer trembling aspen, poplar, willow, and birch; half a hectare of aspen will support one beaver for a year. They also swim out under the ice and retrieve the thick roots and stems of aquatic plants, such as pond lilies and cattails. During mild winters and warm days in March and early April, adult beavers emerge from their dull aquatic world to feed on fresh woody stems along the shore. On such forays they often fall prey to hungry wolves. Beavers shift from a woody diet to a herbaceous diet as new growth appears in the spring. During summer, beavers will eat grasses, herbs, leaves of woody plants, fruits, and aquatic plants. Beavers mate in the winter months, January and February. The kits are born in April through June. When they are two years old in the summer, they build their own dams and find a mate in their second winter. Many years ago people trapped beavers for their valuable fur. Let’s take a walk down memory lane with one of Canada’s most iconic species.